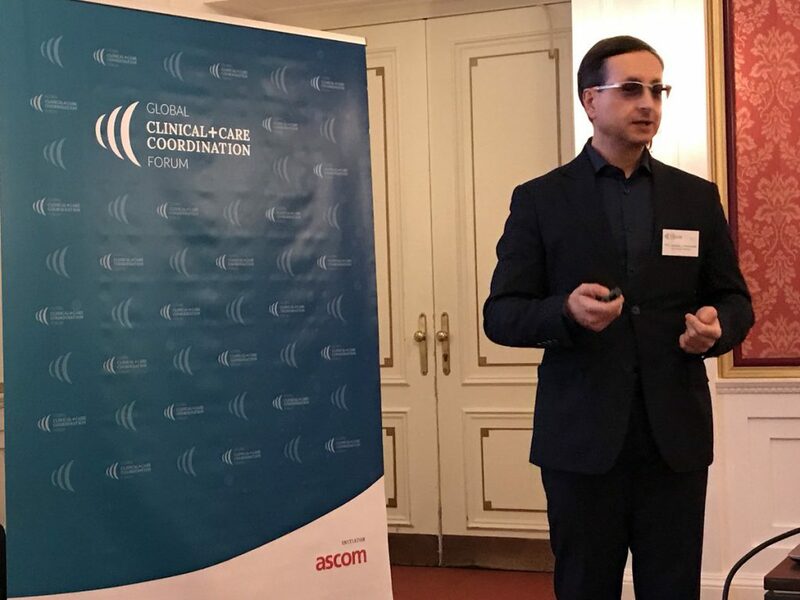 This was the starting event for the Global Clinical + Care Coordination Forum (GCCCF): In Warsaw/Poland late November, leaders from care provider organizations, professional bodies, policymaking, and the industry gathered at the famous Bristol Hotel to discuss innovation strategies. What is the Forum, and what are its aims? It is open to key stakeholders involved in care providing and care optimization, explained Ljubisav Matejevic, President and Founder of the GCCCF. 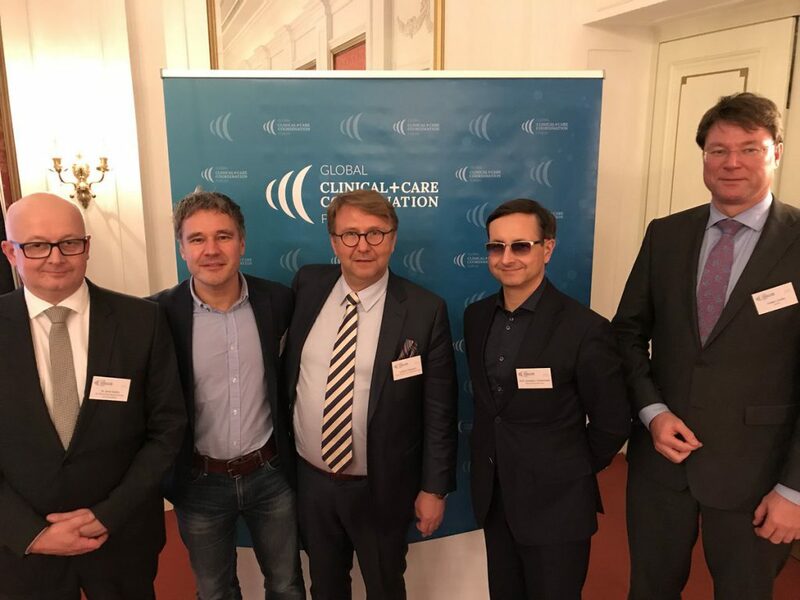 International key representatives were invited to participate at the Roundtable in the Polish capital. This ecosystem aims at improving quality of care and patient safety, and at making workflows lean and efficient, said Matejevic. Four elements are at the core of strategies targeting these goals: Information, communication, collaboration – and the coordination of activities in the continuum of care. Suitable technology is available; the challenge is to identify the right solutions and adequate financing. Poles can be proud of some achievements of their health system, underlined Prof. Jaroslaw J. Fedorowski. In describing the current situation, the President of the Polish Hospital Federation and of the Polish Association of Managed Care Governor (PL) and President’s Committee Member of the European Hospital and Healthcare Federation (HOPE) mentioned that major medical advances have been demonstrated and that, as an example, mortality in hospitals is low compared to other countries for certain – including cardiac – conditions in the first year; and administrative spending is only 1 percent of total cost which runs at 6.85 percent of the GDP. While the life cycle of devices is only half that in Germany, general investments ­­are lagging by EUR 16 bn. Adding to a mixed overall picture, mortality rates are up for the conditions described starting year two following therapy – caused, e.g., by shortcomings in the coordination of care activities. The Polish hospital landscape is heterogeneous – with old and new, and general as well as specialized hospitals. There are 594 public and 72 private hospitals with a total of 145,000 beds and a budget of EUR 7.5 bn. Reimbursement comes from the National Health Fund through capped DRGs. A lot needs to be done; reforms by the Ministry of Health have been “a difficult ride”, outlined the healthcare leader. The currently budgeted modernization concept calls for a hospital network targeting coordinated care, aiming at better access to hospitals and outpatient clinics, and at reduced waiting times. Future investments will depend on performance. Just like in most healthcare systems, the ageing society and increased shortage of staff present a key challenge. To increase productivity is part of the path towards safeguarding access to care. On the other hand, quality and patient safety aims need to be reached, and the patient has to be recognized, and involved, as a partner. This includes patient empowerment as well as implementing patient responsibilities regarding, e.g., adherence to therapy, said Prof. Fedorowski. Efficiency, accuracy, recall, satisfaction – in working towards these ends, information and communication technology is the ally of providers, and digital transformation will play a major role. In summarizing further major trends, the healthcare leader described the need to change hospitals into knowledge institutions for better care and to invest in sustainability. Providers have to move from stand-alone organizations and departments in their physical boundaries (bricks) to IT-enabled networks interconnected with interoperable patient records (clicks); cardiology with its high incidence of high-risk cardiovascular diseases is a case in point. All this requires new thinking on the part of the players. Silos lead to inefficient use of resources, agreed Dr. Jerzy Szebla. The Medical Director of Włoszczowa Hospital and Consultant detailed the challenges of modernizing and restructuring the hospitals in Poland. Where should the money for restructuring hospitals according to the Law of October 2017 go to achieve maximum benefit for patients? Should it be used to find qualified staff – anesthetists, surgeons, pediatricians? Or should it be invested in refurbishing ward rooms and IT, in modernizing work processes? Which priorities will be most effective, and what is ethical to do? While Dr. Szebla asked many questions of strategic relevance, he did point to key building blocks of a modern hospital: a proactive team, good medical-diagnostic equipment, well organized structures, and information-communication systems which help improve and speed up information flows. Technology is available today to help improve the situation of patients with a risk of fatal cardiovascular events such as stroke, demonstrated Dr. Thomas Huebner. The CEO of Preventicus described how his digital solution “Preventicus Heartbeats” has successfully delivered on its promise to detect atrial fibrillation before strokes may occur. The clinically validated app measures a person¹s heart rhythm just with smartphone camera in ECG comparable quality, and identifies arrhythmias and communicates them to a telecare service with health professionals who will decide on the subsequent diagnosis and treatment path of the patient. The Return on Invest, according to Huebner, could be demonstrated to payer organizations within one to two years. 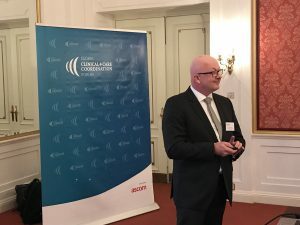 Regarding the development of digitization in healthcare, Holger Cordes, CEO of Ascom, was convinced that digitization can, has to and will change the paradigm in healthcare – however, only if it could support ad-hoc, mission-critical and mobile workflows. Rounding up the active discussions, Matejevic underlined: this exchange of thoughts in Warsaw was the beginning of a long journey. Impressed with the top-quality presentations and the profound ideas exchanged at the GCCCF Roundtable, he invited participants to work on closing the gaps in the continuum of care with their colleagues, associations, policymakers, and industry representatives across borders to sustainably enhance the quality of care and patient safety. The Global Clinical + Care Coordination Forum (GCCCF) provides a holistic view on the necessary transformation of care delivery. Aging populations and rising patient expectations in conjunction with increasing budget constraints for healthcare and social care demand innovative solutions. In view of the enormous challenges we are facing worldwide in the clinical and care context, it is obvious that sustainable solutions can only be developed by interdisciplinary collaboration between academia, politics, industry and civil society.